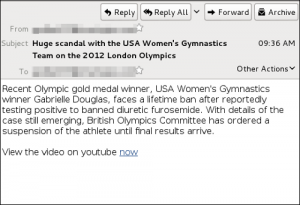 SophosLabs has intercepted a malware campaign that has been spammed out, exploiting interest in the London Olympics which are currently making headlines and filling TV schedules around the world. 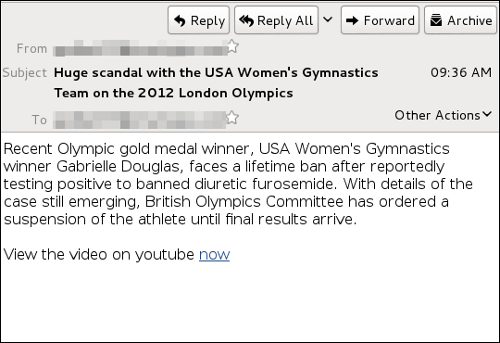 Recent Olympic gold medal winner, USA Women's Gymnastics winner Gabrielle Douglas, faces a lifetime ban after reportedly testing positive to banned diuretic furosemide. With details of the case still emerging, British Olympics Committee has ordered a suspension of the athlete until final results arrive. Sophos products have detected the malware as Troj/Agent-XIK and Troj/JSRedir-IA.